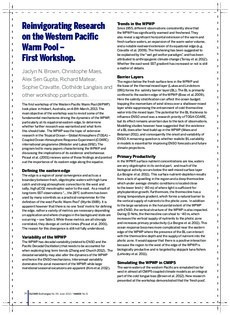 The first workshop of the Western Pacific Warm Pool (WPWP) took place in Hobart, Australia, on 4-8th March, 2013. The main objective of the workshop was to revisit some of the fundamental mechanisms driving the dynamics of the WPWP, particularly at its equatorial eastern edge, to determine whether further research was warranted and what form this should take. The WPWP was the topic of extensive research in the Tropical Ocean – Global Atmosphere (TOGA) – Coupled Ocean-Atmosphere Response Experiment (COARE) international programme (Webster and Lukas 1992). The program led to many papers characterising the WPWP and discussing the implications of its existence and behaviour. Picaut et al. (2001) reviews some of these findings and pointed out the importance of its eastern edge along the equator.